Love was a learned art for Iris Murdoch, because it involved realizing that something other than the self is real. When I arrived in England last fall to pursue a master’s at Cambridge University, I found that social life in that turmoil of towers and turrets and Latin litanies consisted in a series of formal functions governed by unspoken rules I did not understand, at least some of which involved sipping port from inexplicably tiny glasses. (I found this maddeningly inefficient.) Everyone was often drunk, but no one was ever visibly excited. The prospect of a British person becoming drunkenly disheveled, or falling desperately in love, or even typing a sentence in all-caps (a typographic measure I often embraced in my port-inspired communications) was inconceivable. But different, quieter passions are possible, and it soon emerged that there is a uniquely British brand of feeling, a blend of distress and composure marked by a touching compulsion to keep up appearances in the face of interpersonal dissolution. For all its prevalence and subtlety, this mode of engagement is difficult for the uninitiated to decipher or even to discern, and I would have remained oblivious of it if not for the works of Dame Iris Murdoch, a connoisseur of British emotional life in all its baffling permutations. Murdoch had a busy career. When she died in 1999, she was an established novelist, philosopher, and “public intellectual”—an unusual set of roles for a woman of her era. Born in 1919 in Ireland but raised in London, Murdoch studied at Oxford and Cambridge. In 1948, she was awarded a fellowship in philosophy at St. Anne’s College, Oxford, where she would teach for almost 20 years. Her scholarly area was ethics, and her primary preoccupation was love, both romantic and platonic. This was a topic whose manifest importance she felt was chronically neglected by her peers, most of them analytic philosophers. Her stint as a doctoral candidate at Cambridge coincided with the tail end of Wittgenstein’s tenure there, and the intellectual community he left in his wake had succumbed wholesale to his mania for dry, quasi-mathematical philosophy. Murdoch found this approach probing but deadening, and she preferred the lyrical imprecisions of the Continental tradition. Of particular irritation to her was the notion that morality is a matter of publicly perceptible behaviors, with its attendant disregard for the invisible vagaries of experiential life. This widespread behaviorist tendency jarred Murdoch, who believed that the fundamental currency of ethical philosophy was not action but rather intention or attitude. Murdoch’s research in this domain was conducted, for the most part, in the first person. Pathologically passionate, she threw herself into a series of exuberances and obsessions, flitting from affair to affair. Her open marriage to the Oxford literary critic John Bayley, who turned a blind eye to her emotional promiscuity, is the stuff of literary legend. She fell in love easily, madly, and often. But if she was nearly as prolific in love as she was on paper—she wrote 26 novels in her 79-year life—she was also staunch in her devotions, corresponding with former lovers for decades after their affairs had ended. Many of these letters are anthologized in Living on Paper, a collection amassed by scholars at the Iris Murdoch Archives at Kingston University, London, where some 3,200 of her missives are housed. The book is outfitted with thorough introductions and commentary from the scholars Avril Horner and Anne Rowe. It can be strange to see Murdoch’s communications in this orphaned form, without their presumed responses or prompts. Yet it is also fitting: Murdoch’s lifelong fixation was love’s potential for producing one-sided or asymmetrical exchanges. Many of her protagonists are delusional lovers, obsessed by fantastic distortions that they have projected onto the ostensible objects of their affection, and she recognized this same dangerous tendency for romanticization in herself. Falling in love is for many people their most intense experience, bringing with it a quasi-religious certainty, and most disturbing because it shifts the centre of the world from ourself to another place. A love relationship can occasion extreme selfishness and possessive violence, the attempt to dominate that other place so that it can be no longer separate; or it can prompt a process of unselfing wherein the lover learns to see, and cherish and respect, what is not himself. At its best and most effective, fiction presents one solution to the epistemic difficulties of loving. As the protagonist of the novel The Black Prince, himself an aspiring writer, insists, “all art is the struggle to be, in a particular sort of way, virtuous.” Murdoch’s art attempts to be virtuous by inhabiting its characters and thereby cultivating its author’s and its readers’ empathetic imagination. Sometimes the attempt is successful. Even when it isn’t, it’s certainly a thrilling introduction to a highly civilized sort of sentimentality, full of seething emotional crisis, yet tempered by a characteristically British dryness. But Murdoch’s novels can verge on the formulaic, and their dramas often feel rehearsed. Their protagonists are Oxbridge-educated Londoners, always drunk and seemingly always drinking (often from normal-sized glasses, or even bottles), who fall suddenly but disastrously in love with one another’s spouses and paramours. They come to abrupt emotional realizations, write long-winded letters, and make pregnant allusions to Greek mythology. Invariably, they stage “scenes” in various “drawing rooms,” most of which are conveniently outfitted with recurrent symbolic props. Spectacular chance encounters ensue. The Thames is moodily personified. On the surface, these are neat, character-driven, Jamesian affairs (Murdoch much admired James), but a vein of treacly spirituality runs through them, often to overwrought effect. A Severed Head and The Sea, the Sea, the two works published in the new and elegant Everyman’s Library edition, are quintessentially Murdochian specimens, full of intrigue and pining. (For the latter novel, she was awarded the Booker Prize after decades of fruitless nominations.) They have a theatrical, breathless quality, and their inhabitants introduce themselves with clumsy and direct courteousness. There is always, in Murdoch’s canon, some variation on the protagonist’s entrance in A Severed Head, which begins: “I seem to have started here upon some general explanation of myself, and it may be as well to continue this before I plunge into a narrative of events which may, once under way, offer few opportunities for meditation.” Convoluted revelations follow: Martin Lynch-Gibbon, who so graciously introduced himself above, is conducting an affair with Georgie, a young economics lecturer; his ethereal wife, Antonia, attempts to leave him for Palmer, a subdued American psychoanalyst with a sinister appeal, but later divulges that she’s been in love with Martin’s enigmatic brother all along. Meanwhile, Martin has fallen abruptly in love with Palmer’s sister, a severe anthropologist who likens her affect to that of the severed heads she studies. And so on. The Sea, the Sea resists many of these more facile enchantments: It is Murdoch at her most believable. The novel follows Charles Arrowby, a retired thespian of some renown, who has exchanged the stage for the seaside. In a suitably bleak and perennially damp manor—a place that practically demands a haunting—he begins a journal in which he meditates on his adolescent love, from which he has yet to recover, and a number of subsequent affairs, which he has conducted caddishly. “What suits me best is the drama of separation, of looking forward to assignations and rendezvous. I cannot prefer the awful eternal presence of marriage to the magic of meetings and partings,” he writes. Accordingly, he juvenilely reveres and romanticizes his first love, Hartley: she is the locus of his life’s meaning, a source of effortless togetherness that he never has to confront and can therefore continue to believe in. When he discovers that she is living next door with her longtime husband and kidnaps her, he finally faces the reality of her impoverishment. She is, it turns out, as unlike Charles’s wild imaginings as possible: she proves a very ordinary, even exaggeratedly average, woman. Charles is an unreliable narrator, blinded by his own self-absorption, and Murdoch ingeniously crafts a first-person account that reveals its narrator’s own myopia. You never had any imagination, no wonder you couldn’t write plays. You are a cold child. You want women but you are never interested in the people you want, so you learn nothing…. You are fundamentally vicious, but somehow immature. Later, Charles protests that he doesn’t despise women because he “was in love with all Shakespeare’s heroines before I was twelve.” His friend replies, “But they don’t exist, dear man, that’s the point. They live in the never-never land of art…. The real thing is spite and lies and arguments about money.” Charles, who nurses a studied aversion to anything complex, messy, or involved, never sticks around for the inevitable dissolution of his dalliances, when excitement begins to give way to recrimination and pleasure begins to require effort. Charles’s patent lack of interest in the inner lives of others is at the root of his misguided fixation on Hartley, about whom he knows nothing: He cannot recall that she doesn’t like olives and forgets whether she takes milk or sugar in her tea. Hartley gently explains to him, “I’ve changed so much, I’m a different person…. you care about old times, but that’s not me—” Charles, a product of the late 1970s, is an evolved version of Bradley Pearson, the blindingly self-absorbed protagonist of Murdoch’s earlier novel The Black Prince. Like Charles, Bradley makes no attempt to understand other people’s experiences. “You mustn’t reject people, you mustn’t write them off. You must be curious about them. Curiosity is a kind of charity,” one of his friends instructs him. Even when Bradley falls fervently in love with Julian, the young daughter of his professional rival, he displays little interest in her perspective. “You talk as if there were nobody here but you,” Julian chides. Bradley replies, “There is nobody here but me…. You’re just something in my dream.” Although Julian is more than 20 years Bradley’s junior, her emotional maturity far exceeds his: “Your love must be very—what’s the word—solipsistic if you don’t even imagine or speculate about what I might feel,” she concludes. There is a gendered element to the distribution of empathetic imagination in Murdoch’s oeuvre, and many of her books are subtle mockeries of men too obtuse to recognize their own manifest callousness. Her specialty is a certain brand of lazy, grotesquely selfish man—lightly condescending toward women, mildly alcoholic, chronically underachieving (usually a failed writer in denial), and hopelessly self-absorbed. An activist at one point describes Jake, the protagonist of Murdoch’s debut novel Under the Net, as “a talented young man who is too lazy to work,” who holds “left-wing opinions but take[s] no active part in politics.” What this familiar figure erroneously calls “love” manifests itself instead as an unassailable inconsiderateness perhaps more disturbing than active malice would be. A man so in love with himself and his clichéd brand of self-indulgent torpor can only regard women as sacrificial objects to worship from a distance. The Black Prince provides valuable insight into the quiet, good-natured selfishness that characterized so many of the men Murdoch loved. Writing to her lover Wallace Robson, she evokes the fundamentally narcissistic apathy of the men who figure so often in her fiction: “You’re not unselfish or imaginatively considerate about people either—though when you stumble over it, you’re good to them and utterly without malice.” Failing to make an effort, she implies, is more than a passive mistake; it is an ethical transgression. If empathetic imagination is a moral requirement, then contented entitlement is a moral failure. But Murdoch’s own fiction frequently commits the very sins she warns against. Writing to Foot in 1964, she laments “how little one understands other people. I wish I could create really different people in my novels, but they are all me.” And indeed, much of Murdoch’s fiction falters when it comes to narrative mechanics. Her books tend to feature some subservient character who conveniently professes an eagerness to perform mundane household tasks—details that might otherwise burden the protagonist and distract from the whirlwind of dramatics that occasion a novel’s worth of lies, proclamations, and realizations. Sometimes her symbolism is heavy-handed, her characters caricatures. Her fiction is great fun, but like her male protagonists, it’s sometimes a little obvious. Murdoch’s novels are mostly failed epistles: In many of them, there’s an attempt at direct address. Bradley in The Black Prince tells his readers that “perhaps somehow unconsciously my whole oeuvre, has been a communication addressed to you.” In contrast, Murdoch’s letters are successful communications, dialogic in nature. They fulfill the promise of her fiction, presenting true antidotes to Charles’s and Bradley’s warped, one-sided loves, expressed ineffectually over vast conversational distances. A social thinker, Murdoch is most herself in conversation. 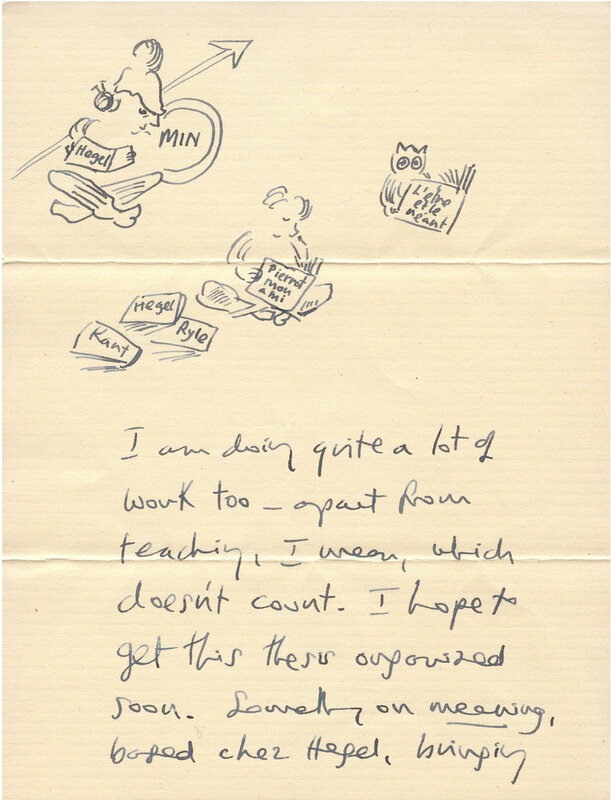 (In a 1943 letter to Frank Thompson, a school friend, she writes, “Oh so much in need of intellectual intimacy. The patient mind which is prepared to comprehend my own and toss me back the ball of my thought.”) If her books are performances, often implausibly theatrical, her letters are effortlessly sincere. But this ravenous hunger for communication was the basis for her fierce loyalty, her appreciation of other people on their own terms. Murdoch was an exceptional friend, unwilling to “mislay” people and passionately interested in even the minutiae of their experiences. She wrote to Foot in 1982, “Write, and tell me more of your life and what you are doing. How do you EAT?” Her boundless curiosity about others is matched by her own courageous talent for self-exposure, and in her letters we detect the textures of her own idiosyncratic joie de vivre. Murdoch is anxiously thoughtful but also bracingly, endearingly human, and tucked between lofty meditations on philosophy are observations about her Cambridge zoologist housemates, who were “very nice girls, but talking to each other all the time about fungi”; her distaste for daffodils, about which she “simply cannot share Wordsworth’s feelings”; and her affinity for wombats, because “things with large heads [are] endearing.” In San Francisco, she encounters “30,000 tall healthy young people jogging”—still an apt summary of that preternaturally health-conscious city.